The 2019 Roush Ford F-250 and F-350 Super Duty pickups have been unveiled, and they are what one would expect from the Michigan performance company. You’ll sit higher, while still being able to embrace the mighty Super Duty towing numbers. 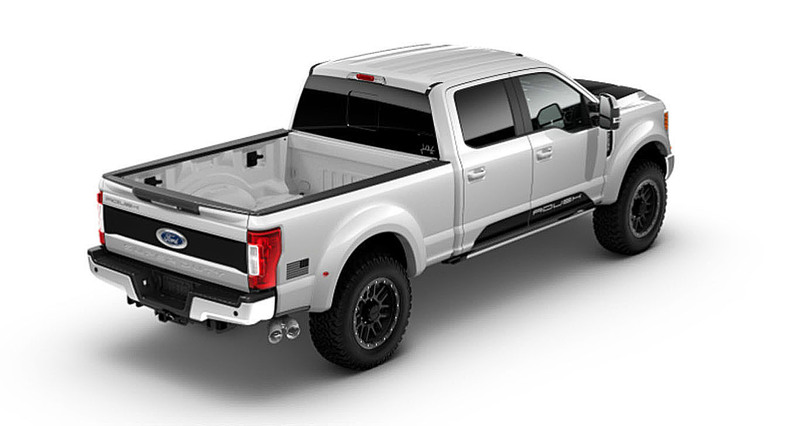 Each Roush Super Duty pickup gets a Roush / Fox 2.0 Performance Series Suspension upgrade, which raises the truck 1.5-inches yet Roush claims that the augmentation maintains all factory towing and hauling capabilities. Based on 2018 Super Duty figures, the tow ratings range up to 21,000 pounds depending on how they are equipped. Included with the Roush Super Duty pickup is a set of uniquely-styled 20-inch wheels with integrated bead protection wrapped in incredibly capable BFGoodrich KO2 All-Terrain LT325/60R20 tires. Roush’s attention to detail goes all the way down to the style of lug nuts it uses on the Super Duty trucks. Unlike typical aftermarket tuners, they use a washer-style lug that has a flat load-bearing surface to maintain all towing capabilities from the factory. Among the other standard features on the 2019 Roush are front grille and accent lighting, front bumper cover with adaptive cruise compatibility, fender flares with integrated accent lighting, DPF-Back Exhaust System on diesel models, hood graphic, rocker graphics package, tailgate blackout graphic with accent color, USA Flag Graphics, “Roush” Embroidered Headrest, Roush Serialized Console Badge, Square “R” Hitch Cover, Roush molded floor liners by WeatherTech and chrome lug nuts (capped) with washer bearing surface. Roush options are full body side stripe graphic, a console vault that is installed in the center console with a four-digit combination, and the Roush off-road utility kit that comes with high quality jumper cables, tow strap, tow hooks, ratchet tie-down straps, gloves, flashlight and a carrying bag. The Super Duty package, not including the 2019 F-250 or 2019 F-350, starts at $13,880. A three-year/36,000-mile warranty backs all Roush components. 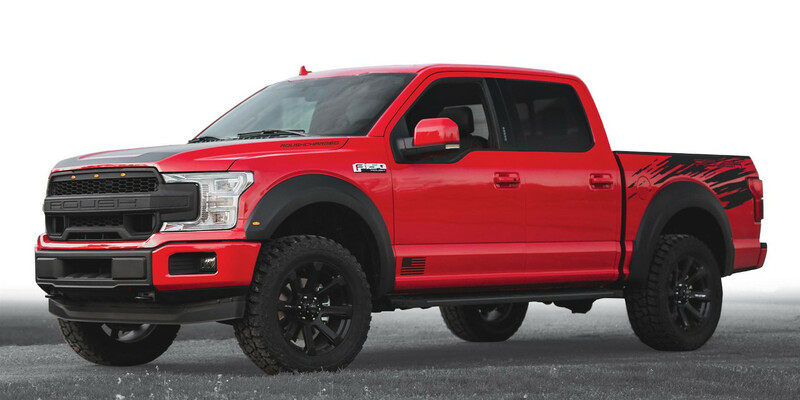 In September, Roush revealed the 2018 Roush F-150 SC, which slots below the Roush Super Duty. The folks at Roush Performance managed to squeeze an extra 50 horsepower out of its blown 5.0-liter Coyote V8 in the Roush F-150 SC, thanks to a new Roush TVS R2650 Supercharger Package. Peak torque output stands at a mighty 610 lb-ft, and you’ll hear every horsepower and pound-foot thanks to its standard, boisterous dual-tip performance exhaust. Which Roush Ford Is Best? A Stage 3 Mustang, Or F-150 SC? The payload sticker on drivers side door of my new F250 Roush Superduty is 2000 lbs less than the normal Superduty. No one can tell me why this is. How do I find out?